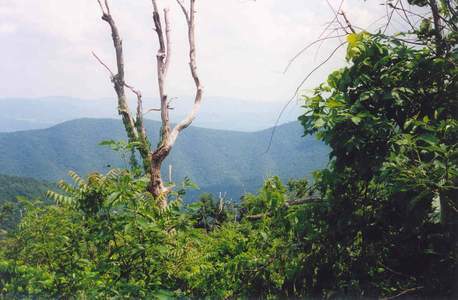 Description: This is a moderate 11 mile loop on Massanutten Mt. It is probably one of the least traveled circuits on the mountain. There are a couple of partial views as you descend on Bear Wallow Tr but more can be had if you take a little detour along the Meneka Tr. Little Passage Creek is pretty especially in the spring. Keep an eye out for a wide assortment of wildflowers and the sweet fragrance of Fringe Tree blossoms (AKA Old Man's Beard) in June and July. 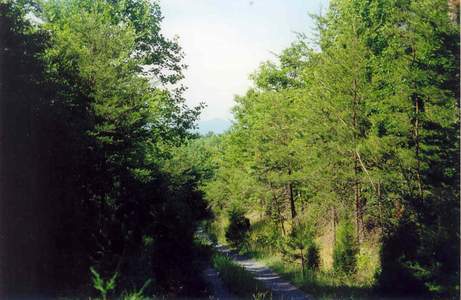 The trailhead is directly across from the entrance of the Elizabeth Furnace Family Campground on Fort Valley Rd. Trail Notes: From your cars, proceed up the purple blazed gravel road. This is Mudhole Gap Trail. When I first hiked this route in 1998 the gravel road was more open to the sun but in recent years the forest has started to grow in around it. Walk around a forest gate. 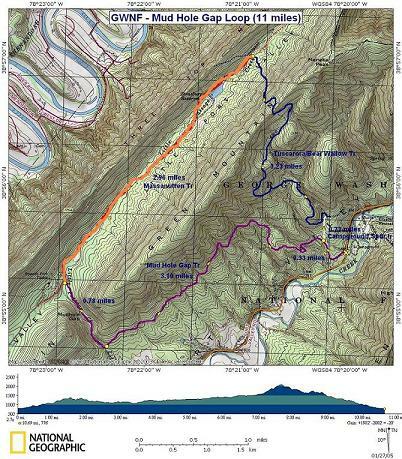 In about 0.3 miles from the start you�ll pass a white blazed spur trail on your right (your return route). At first the trail will be steep and winy. The grade soon lessens and straightens out as you walk along the side of the mountain. At about 1.5 miles it begins a gradual descent and at about 3 miles from the start ends in a small grassy turn-around area. Directly across from this clearing the trail continues as a footpath. Use this path to descend to Little Passage Creek. Turn right and follow the footpath, crossing the stream a couple of times, for about 0.8 miles. Arrive at another maintained gravel road. 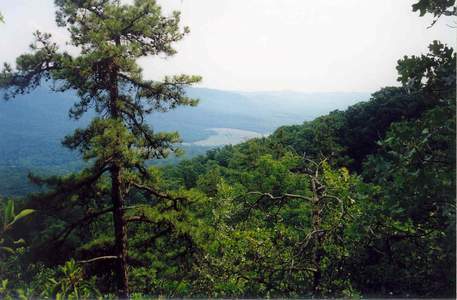 This is part of the orange blazed Massanutten Trail. Turn right here and begin a steady climb up the service road. The pitch of the trail increases as you get further up the trail. The service road continues all the way up to Signal Knob. You can use it to reach the next trail in this route but I recommend taking the footpath to the left for a short excursion around the western side of Strasburg Reservoir. Keep an eye out for some perfectly cut stone near the trail. 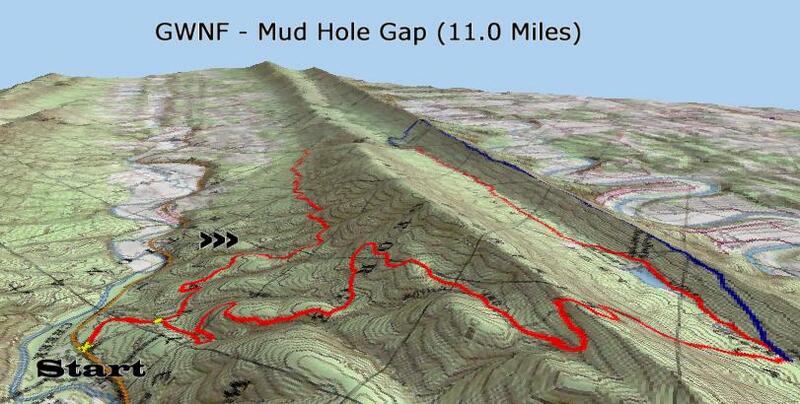 At about 3 miles from leaving the Mudhole Gap Tr you�ll return to the service road. Cross it and climb up the blue blazed Tuscarora/Bear Wallow Tr. This is the steepest climb on the entire mountain. Fortunately it is only about a mile in duration. At the top arrive at white blazed Meneka Tr on the left (not shown on this map but is shown on the Signal Knob/Mt. Meneka Loop map). If time and stamina allows turn left and follow it for a while for some nice views of Fort Valley. Otherwise, proceed straight on the blue blazed Bear Wallow Trail for about 3.2 miles. 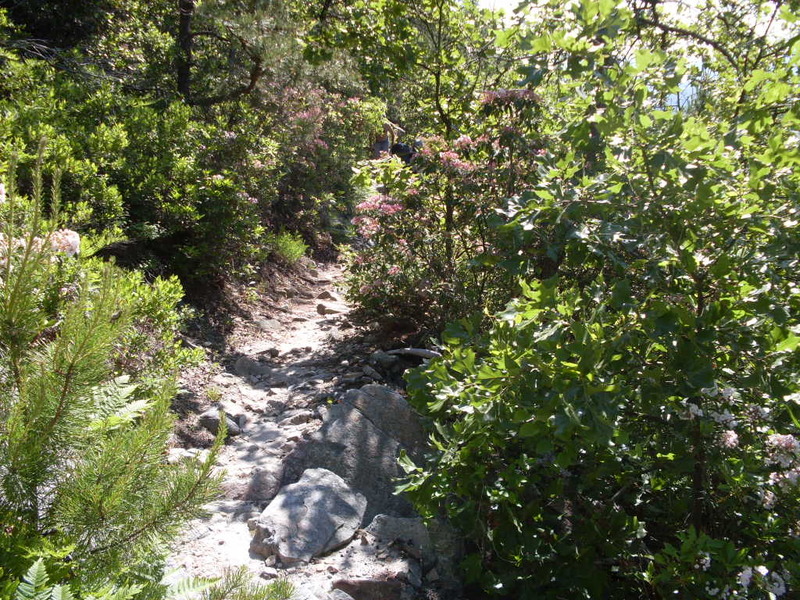 You�ll pass an old trail on the right with pink blazes painted over black. This used to be the return leg of the trip. Stay on the Bear Wallow Trail. 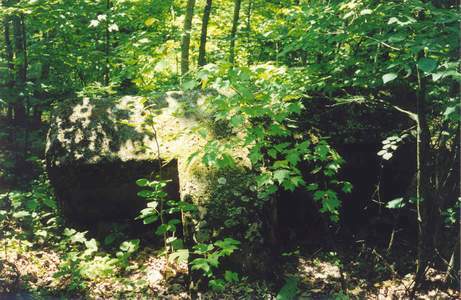 At about 2 miles from the Meneka Trail junction come to a white blazed spur trail with a sign for the Elizabeth Furnace Campground. Turn right here and soon arrive at the original gravel road you started on. Turn left and soon return to your cars. Critique: Cognac Jack and Wooly Bully did a variation of this hike as an overnight backpack. Saturday started out cool, clear, and breezy, and stayed that way. Starting at around 9:30 at the Elizabeth Furnace Recreational Area "inner parking lot", we followed the white blazed Botts Trail, then west (right) on the Sherman Gap Trail to the Passage Creek. No bridge here, definitely a boots-off crossing! Thankfully the water was fairly low and not all that cold. 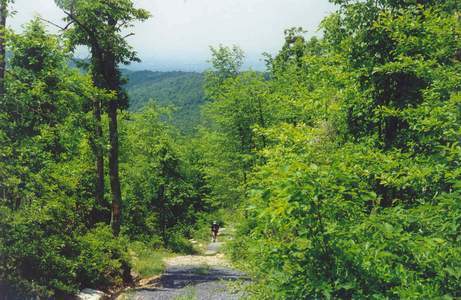 The trail then crosses Fort Valley Road, passes thru a gravel parking lot, and proceeds to the Mudhole Gap Trail. The first part of the Mudhole Trail is a gravel service road. The last part becomes more interesting when it passes over a single track and then over an old wagon road. 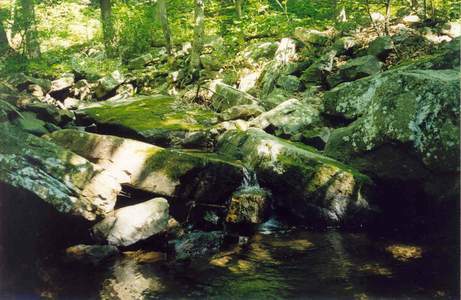 The wagon road parallels Little Passage Creek, and fords it at least 5 times, all rock-to-rock crossings. A pretty stream, flowing fast and making lots of water noise. We had a pleasant lunch at the 2nd ford. Beware of the third ford - we found out that hiking poles float down the rapids quite nicely! The last part of the Mudhole Gap Trail gets pretty busy, where it dead-ends at the intersection of the Massanutten Trail (MT) and FR66. After taking a right on the MT we passed several car campers on the right side of the trail, and the Powells Fort Camp (closed) on the left. The MT follows another gravel road for around 2 miles, and then follows a nice trail around the west side of Strasburg Reservoir to some large some large camp sites at the north end. We stopped here for the night, at around 2:30, 9 miles from the starting point. Set up camp, took a walk around the reservoir which is quite pretty, and then settled down to dinner. With all of the young, straight as an arrow tulip poplars we were not able to find a suitable branch for hanging the bear bag, but Cognac Jack found a horizontal section of a snapped off tree that worked nicely. It was around 25 feet up, took me four tries to get the rope over and back down. Despite being a holiday weekend, we were the only campers at the reservoir. Clear cool night, nice background from the fast flowing stream beside the campsite. A whippoorwill started up around 10pm, close by at first but then moving farther away. Sunday morning was clear and cold, by 7:30 we were back on the MT which shunts back onto the gravel service road just north of the reservoir. The road become progressively steeper as it approaches Signal Knob. Signal Knob was fantastic on this absolutely clear and windless morning, with great views to the west and north. We continued on the MT, first fairly level along the ridge top and then descending with the trail becoming all rocks in places. This is a very pretty trail, with occasional views to the left, and with the laurel just starting to bloom. As we moved down the mountain we passed the first hikers of the day, and the traffic got heavier at the trail neared the Signal Knob parking lot. Another mile got us back to the car, for a total of 8 miles for Sunday. After stowing the gear and cleaning up, we had a great lunch in Front Royal at the Jalisco Mexican Restaurant. We had no trouble cleaning our plates and downing several large glasses of sweet tea. By 2:00 we were back at the I-70 / Rt. 94 park and ride. This was a great backpack, and we figured out some nice variations of the loop for future trips. Many thanks to Cognac Jack for putting this together!